Weinheim (Germany), September 25, 2018. A component’s reliability and service life are top priorities for wind turbine manufacturers. This is especially true for main shaft seals, which are exposed to powerful forces. In addition, larger shaft diameters have prompted adoption of new, more stringent operating requirements. Freudenberg Sealing Technologies has succeeded in developing a new seal that reliably prevents leaks from the grease-lubricated main bearings used in conjunction with these shafts while tolerating strong shaft runout. The company is exhibiting this bearing, along with other innovative wind energy solutions, at booth 531 in hall B6 during the WindEnergy 2018 trade fair in Hamburg (Germany) from September 25-28. Manufacturers continue to increase the size of wind turbines in an effort to generate an ever-increasing supply of clean energy. Larger turbines result in lower material and construction costs than installing multiple, smaller turbines. Rotors with a diameter of 180 meters are no longer rare. But systems of this size produce powerful forces during operation that impact main shaft roller bearings and seals, thus requiring new seal designs that have been adapted to these conditions. Freudenberg Sealing Technologies has now succeeded in developing a seal for grease-lubricated bearings for large shaft diameters. The product can be used for radial internal and external sealing and can even tolerate strong shaft runout. Traditional shaft seals that produce pre-stressing forces on the seal lip by using a worm spring reach the limits of capabilities when large diameters become a factor in their design. In addition, solutions providing radial external sealing are difficult or even impossible to execute with this design. 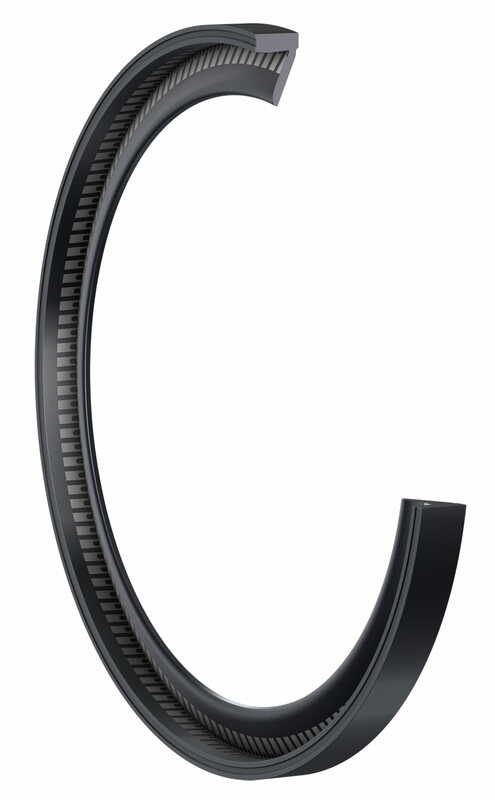 Freudenberg Sealing Technologies’ new shaft seal “Seventomatic” is intended for shaft diameters starting at 1.5 meters. It uses a meander spring to build up the needed pre-stressing forces. The product gets its name from the figure “7” – a long sealing leg is linked with the stationary portion of the seal using a flexible joint. The Seventomatic seal produces consistent linear forces and is less susceptible to shaft runout than other shaft solutions. In its standard size, the shaft seal tolerates a deflection of ±4 mm without a decline in its performance. As a result, it handles the shaft’s manufacturing tolerances extremely well. It is made from hydrogenated nitrile butadiene rubber, a material in the Ventoguard family of wind energy solutions. The basic form of the Seventomatic is based on Freudenberg Sealing Technologies’ tried-and-tested seals for tunnel boring machines. The goal was to combine the special design of a seal for tunnel boring machines with the advantages of a classic radial shaft seal ring for the rotor’s main shaft. Comprehensive simulations made it possible to ensure a robust design in advance. Using the data sets they acquired, engineers created a mathematical model so they could predict the behavior of the seal with regard to linear force and the maximum potential results of shaft runout and eccentricity. These robust design simulations covered the requirements so completely and precisely that it was hardly necessary to make adjustments to the physical prototype. When endurance tests with approximately 15 million load changes were run on samples, the engineers found neither identifiable damage nor limits on the Seventomatic’s capabilities. Other testing dealt with temperature changes between -30 and +100°C as well as stability during vibrations of 8 Hz with an amplitude of ±3 mm at 110°C. In addition, there was an investigation of the linear forces of mounted seals after 240 days of storage at room temperature and at 100°C. The results showed that the new Seventomatic seal reliably retains the grease used in turbine roller bearings and is not susceptible to static and dynamic eccentricity while offering a constant linear force. 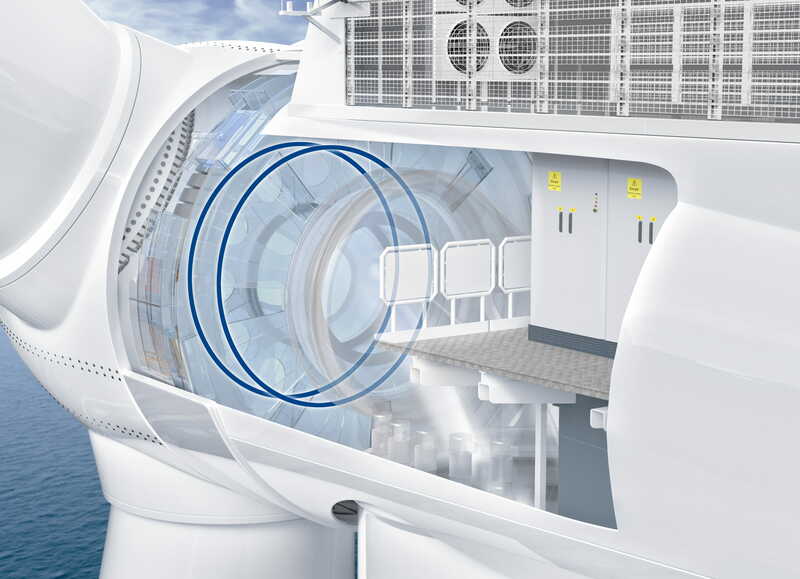 The new Freudenberg Sealing Technologies development supports the trend to ever-larger wind turbines for the efficient and reliable production of clean energy. Earth Day is an annual environmental call to action to draw attention to issues like climate change, industrial pollution, dwindling natural resources and other global challenges.